This complete conference exhibiting package consists of the super sleek and sophisticated Dash Roller Banner Stand, extremely popular Pantone-matched tablecloth, 250 business cards and A5 leaflets. Both displays are individual best sellers and the pairing is perfect for when you’re travelling to a variety of events. The kit price of £174.98 saves you 15% compared to if you buy these two items separately, plus the cost of the printed literature. This kit is perfect if you’re exhibiting at a conference. The price includes an easy to assemble Dash Roller Banner Stand which takes seconds to put up and includes the stand, the printed graphic of your choice and a durable carry case. To create a fully branded conference display, we’ve also added our fully printed Pantone-matched tablecloth. 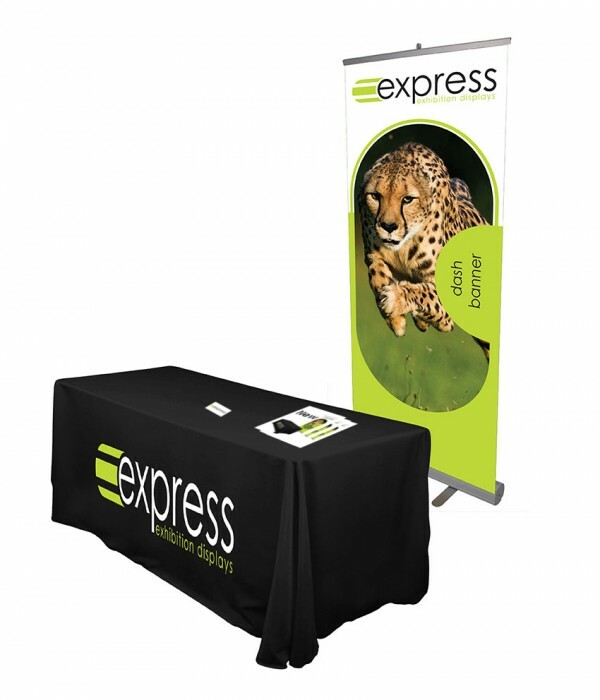 Fully machine washable and durable, we can print your tablecloth to your exact brand colours and include your logo. It won’t crack or fade over time as we use a high-tech printing technique that prints the ink into the cloth rather than ontop of it. On top of these fab displays, we’ve also thrown in 250 printed A5 leaflets and 250 printed business cards. 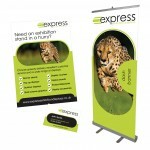 This allows you to make sure that your new artwork on your banner stand can match your printed literature. The kit price of £174.98 saves you 15% compared to if you buy these two items separately.